We are smitten with design duo Combo Colab. Not because we share a similar name (though we think that’s fun), and not because some of us have Argentinean roots (though that’s cool too), but this delightful Venezuelan couple, based in New Jersey, won us over at the designboom mart 2012 with their upcycled, reconceptualized plastic milk crates as stackable indoor/outdoor stools named Xtools (bottom 4 photos), and from there we learned of all their other interesting projects. Carolina Cisneros and Mateo Pinto are architects and artists whose practice is focused on a design/build approach. Their work ranges from small scale works to temporary public art projects. One of my favorites is Mall-terations: a project on the Lower East Side here in NYC a little over a year ago. 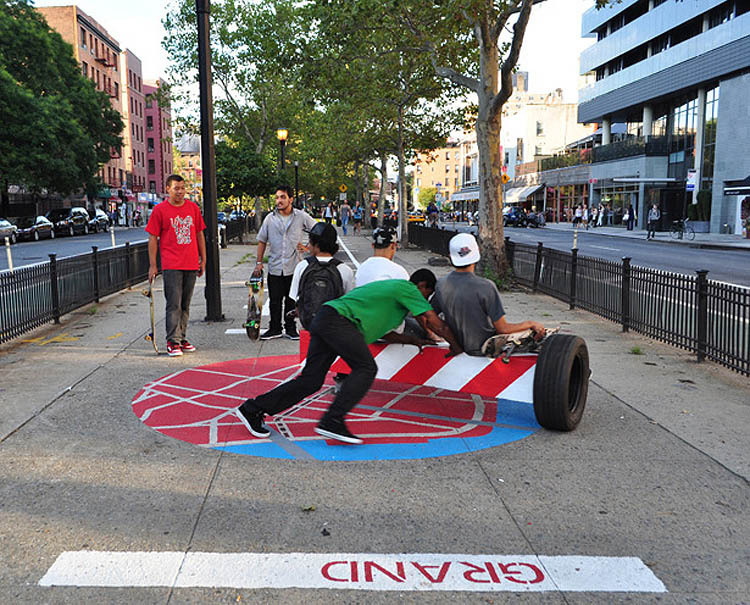 In collaboration with Marcelo Ertorteguy and Sara Valente, as well as neighborhood volunteers, Combo Colab created a series of five rotating benches (Compass Benches) down the mall on Allen Street, overlapping circular neighborhood maps. In addition, a timeline celebrating the history of immigration and ongoing revitalization of the Allen Street Corridor ran along the concrete sidewalk from one Compass Bench to the next. These were just great! More recently, they designed Plop Spots — giant pillows made out of inflatable bags — to generate outdoor seating clusters in and around the Dumbo Arts Festival. All the pillows have fun expressions on them such as “ahhh”, “plop”, and “zzzz”. There’s much more, too. Seedling, Soundscape, and the upcoming Red Hook Food Vendor Market Food Fence… Combo Colab are designers to watch. 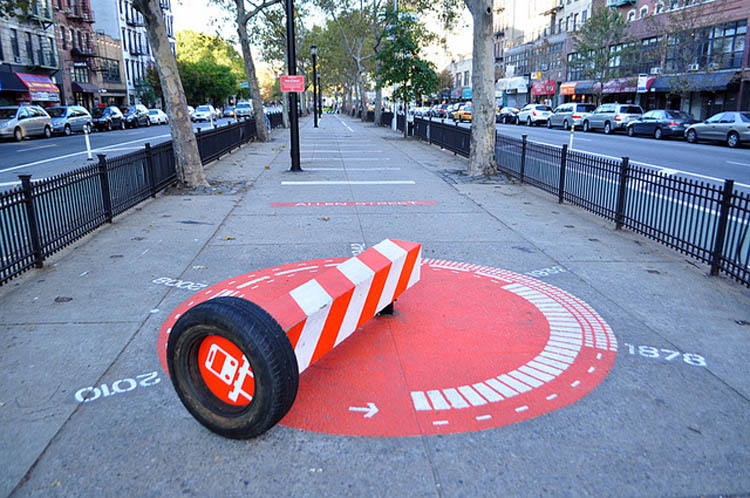 This entry was posted in Architecture, Art, Fun, Interaction Design, NYC, Street Art, Stuff We Like. Bookmark the permalink.